Any way you slice it, this BBR marque XO Armagnac is delicious and interesting stuff. Florence Castarède is a sixth generation descendant of the Nismes-Delclou family and is currently running the stills at this Armagnac house. To underscore its longevity, the Nismes-Delclou house was established in 1832 and is the oldest Armagnac producing house in France. Located in the tiny town of Lavardac, southeast of Bordeaux and northwest of Toulouse, they distill wine made from Folle Blanche, Colombard, Bacco and Ugni Blanc grapes. And while the rule for XO Armagnac is at least 6 years in cask, I found evidence on the web that the Nismes-Delclou version waits in French oak for a minimum of 20. I did double check with BBR about this and while they’re not completely sure, apparently in tastings with the 1990 and 1995 Nismes-Delclou own label vintage Armagnacs, they tasted very similar. Deep amber with aromas of burnt sugar, maple, caramel, marmalade and Seville orange zest, the palate is smooth and complex. Flavours of satsuma, more marmalade and burnt sugar, deep toffee and warmed walnuts, vanilla with toasted marshmellow overwhelm. This is a sumptuous and richly complex spirit. WSET Very Good plus – enjoy as frequently as possible. 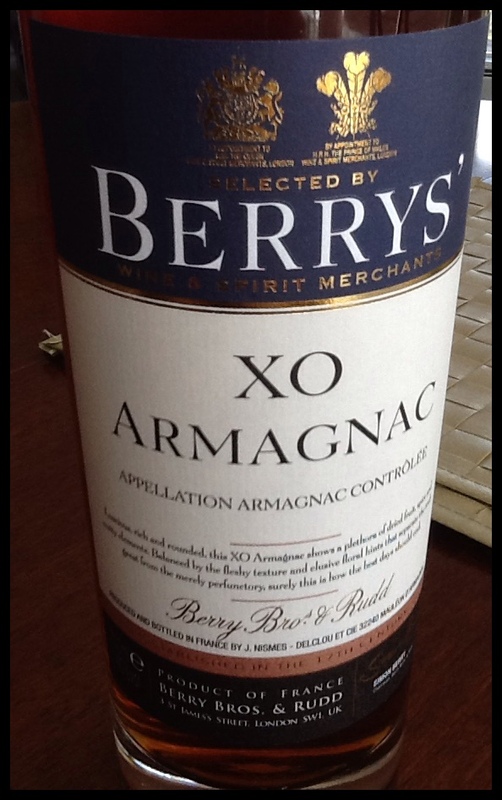 This entry was posted in Armagnac and tagged BBR, Berry Brothers & Rudd, Berrys' XO Armagnac, france, J. Nismes-Delclou. Bookmark the permalink.